Yesterday I ran a game of D&D for four of my colleagues. They didn’t know that’s what they were there for. Such is the power of being the boss and having a training and development budget that encompasses team building events. I had planned this a while back. There’s loads of good reasons to run an RPG for work purposes. It’s great for team dynamics, leadership ability, basic maths and English, problem solving, all sorts. Frankly, I just love playing D&D and fancied the idea of getting paid to do it. My guinea pigs are all tech experts who work in telecoms. They can field strip a laptop blindfold. They also have to serve the public in my stores so they plenty of social skills too. Their predisposition to geek led me to think they’d enjoy it. I had no idea of their previous exposure to RPGs, and wanted to surprise them on the day. Turns out one, Adam, had about six Warcraft characters on the go. Brendan plays Eve Online and Magic in his spare time. Paul and Dan just love the tech, and it’s all about pulling apart hardware and software for them. When I told them we were going to play D&D it went down pretty well. No-one ran off screaming (I am the boss don’t forget, I wanted to stack the deck in my favour) and a couple of them said they’d dabbled back when they were kids. I whipped out a brand new copy of the Pathfinder Beginners Box and tipped my dice out on the table. The dice had to be introduced, especially the d4. Didn’t seem to faze them though. The Box (PBB) has some fantastic character portfolios that do a brilliant job of guiding the noob through the character sheet. Given that this is Pathfinder it’s at the crunch heavy end of D&D play. Ten minutes later we were ready to rock. They picked PCs based on not much more than the portrait (Adam, the WoW vet, grabbed the elven rogue quick smart). The adventure gets straight to the point. There’s a creature, nick named Black Fang, that is stealing and killing the local livestock. the mayor has put up a 1000gp reward for the adventurers who stop the slaughter. The story begins as the party arrive at the cave mouth. I asked the guys to introduce themselves to each other, which is a bit of a rude awakening to roleplaying for some. They were understandably tentative in comparison to seasoned gamers, but they got their point across. I had to ask a couple of facilitating questions, simple stuff like what are you wearing/armed with. They responded happily. Some scouting led to some combat. I had a second table just to one side. I put the battle map and creature pawns on that so we had more room for our character sheets on our table. It was cool to stand round the map like something from a WW2 film, strategizing. It did take longer than I thought for them to decide what to do. I think this comes from not wanting to get it ‘wrong’. Actually, that feeling carried on for the next 30 minutes or so too. For example, whenever Paul’s turn came up in the initiative order he would pick up a d20 and simply roll it. This was learned behaviour from all the other games he’d played were you roll the dice to see what happens, like Snakes and Ladders or Monopoly. It took me slightly aback until I realised that I was in the minority at the table, I was the one who assumed you had to speak before you ‘did’ anything. The same was true of the character sheets. The guys were looking at their sheets to see what ‘moves’ they could attempt. The PBB has a handy ‘what you can do in a round’ section on every sheet, but it doesn’t point out that the only limit is your imagination. My players thought the list was complete. Why wouldn’t they? Once I’d realised this, I simply called a time out and explained how the game could work, that you simply said what you were attempting, as if you were there in the situation, and my job was to tell them how the rules interacted with that, if at all. See, even typing that last sentence out makes it sound more complex than it is doesn’t it? So I decided it was time to lead by example. Cue the NPC, in this case a pair of goblin prisoners with strangely Mexican accents groveling for their lives. Sure, I hammed it up a bit, but nothing that would get me in trouble with HR. That made them smile, and they loosened up a bit, getting some inter party banter going on. What really worked was me using the goblins as catalysts, asking the characters questions and making suggestions that I didn’t want to do as a DM to the players so overtly. That seemed to crack open their inner gamer and we were off. Soon enough we had played through 3 hours of classic dungeon. Yes, there was a dragon at the end. There were also traps, tricks, exploration, negotiation and bloody combat. Did they enjoy it? Yes. Adam wanted to cut lunch short so we could get back to it. Paul and Dan laughed out loud at least a dozen times and they all genuinely thanked me for the experience. I don’t think I’ve made 4 new roleplayers, but that wasn’t exactly the point. I did have some fun with my colleagues, and we all now have a shared experience. Whatever their opinions were of gaming before, at least they’re now based in fact. Lessons learned. Running games in that environment was no real problem at all. I’d pre-selected my players to some extent, but I’d be happy to widen the net next time. It helped that I had a captive audience! I would struggle to just put out an invite by e-mail or stick a poster up and get players. I felt I had to be a bit sneaky to get them in the room first, by which time it was too late. The guys may have enjoyed themselves, but doesn’t mean they’ll be buying T-shirts anytime soon. Occasionally a couple of other staff would come through the room to get their lunch or their coats. It was noticeable that the voices got lower and we all shrunk in our seats a little. Having said that, it we had been having a regular meeting and someone had come through we would have probably paused for them then too. The Pathfinder Beginners Box is a really nice intro set. It’s all laid out beautifully, and the kit is a joy to behold. I didn’t have to do loads of prep, it’s almost playable within 5 minutes of opening the box (assuming a basic knowledge of d20 games that is). On the other hand, the game without a seasoned DMs interpretation and help could become quite cold and functional. It’s the traditional ‘it’s nothing more than a board game’ jibe, but there’s some truth in that. The character sheets have all the mechanical workings out included on them, but none of the ‘try something cool’ advice which is tucked away in the GMs guide. I missed the 4e rules set. Pathfinder has a couple of bits to it that make for a game that requires creativity and passion to make the most of it. 4e is more forgiving to the casual gamer and cool stuff can emerge from dice rolls as well as the players own behaviours. Fantasy is a great backdrop. I didn’t have to explain anything about the setting at all. I said it was a bit medieval, except with magic, but to be honest I didn’t even need to say that much. The box cover is more than enough to get everyone on the same page. Some of the stuff I first encountered in the 70s is alive and well even today. One of the players wanted to call his PC ‘Bob’. I wasn’t having that thank you very much. The PCs wanted to loot everything, including broken clay jugs and a dead lizard. They split the party in the second chamber. They poked at traps to set them off, then they did it again. And again. They bickered over who got the magic items. I loved watching this stuff unfold. It’s the primal language of the gamer, even today. All in all, good times, I would do it again. I will check in with the guys in a couple of days to see what they thought. If there’s feedback there, it will soon after be here! I finally took delivery of a bunch of minis from Reaper. They are technically Pathfinder minis, but I’m using them as generic fantasy figs. Plus, they look great and I want to just take pleasure from painting rather than with any specific project in mind. In the front row we have a couple of serpent folk, one a named character, one a mook. I’ve done some basic dry rushing on the scales which is very easy and very satisfying. 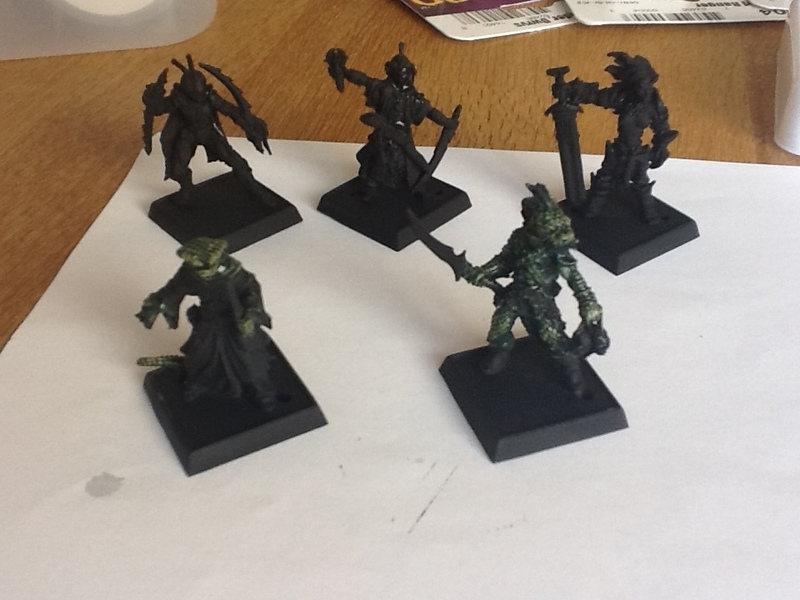 The back row from left to right is a Red Mantis Assassin, a cleric, and a barbarian. The cleric is destined to represent my wife’s PC in our current campaign (assuming I don’t kill her any time soon). The barbarian is just for fun. I’ll stat them up when they’re done, and of course there’s photos to follow. I’ve converted the castaways from Smuggler’s Shiv to 4e. I used the new monster builder so it’s a bit rough and ready, but as companions, they’ll do just fine. I’ve been running 4e intensively since release, it’s a great game, I love it. One of the things I love so much is the way it helps me construct encounters. I’ve had fun building and running them, and when they really work, they’ve been the centrepiece of the session. Recently I’ve been working up a sandboxy campaign, and I’ve been plundering the Paizo APs for inspiration. Where I’ve been coming unstuck is with the encounter charts. Pre 4e, these were simplicity themselves as it was hard coded into the game that you would encounter single creatures (or groups of the same). What I need now is some way of constructing encounter groups. These were included in the first two MMs, but quietly dropped after that. I think that’s a shame, but I doubt they’ll see a return any time soon. So instead, how about we get a decent set of guidelines on making groups out of your books, or building ‘mundane’ solos? Essentially, I want to be able to generate a wandering monster group. Once you’ve made your three rolls, you then have to pick your threats and that’s the hardest part. Given that I want a kind of jungle theme, I really have to make up a list of potentials. Leafing through multiple Manuals and Vaults is hard work so time to turn to the Compendium. It’s worth working up an ‘at a glance’ system to differentiate minions, elites and solos. (Colours can work well too). I don’t really recommend putting in a dice roll at this stage, better to pick and choose. In fact, at this stage I really want to strip out a few creatures that don’t look right, and add in a few from levels 2 and 3. After that, it’s a matter of re-skinning to taste. For example, I don’t really want goblins in this adventure, but they’ll make great pygmies. To be completely honest, all this looks like a lot of work, but it’s not as bad as it looks. The idea is to filter and sort until you’ve got something approaching a theme. I don’t want completely random groupings, and I don’t want to plough through every permutation. This process helps me get an idea of the possibilities, and that’s enough to build memorable encounters that feel like they belong. I’ve been asking a lot of questions about companies’ approaches to adventure design recently, but I haven’t been supplying many of my own answers. Some of that is because I don’t really know the answers! However, there’s a few observations I do have. At time of writing I’m running my weekly group through WotC’s Orcus modules. We’re deep into E1, Death’s Reach. It’s been good fun so far, and we’re one session into the final section, which is a dungeon called the Reliquary of Timesus. Simultaneously, my current read is part 5 of Paizo’s Legacy of Fire Adventure Path. It’s also a dungeon, based in a palace complex set within the City of Brass. It’s called The Impossible Eye. It’s a good read, full of flavour, but looks very tricky to run. There has to be a middle ground between WotC’s dry/linear adventures, and Paizo’s complex/verbose ones. What would a product that took the best of both worlds look like? Let’s take the Reliquary, and reformat it the Paizo way. On the WotC side, they utilise(d) a two book format. The first book has the overview, and the extras like new monsters and treasures, and art work. The second book has the encounters all laid out in a delve format for ease of play. The folder also contains a double sided poster map of some of the big locations in the adventure. (I should say that WotC have moved away from this format in the last year or so, but only in that they bundle all this together into a single book, otherwise it’s broadly the same). Paizo are much more traditional in their formatting. It’s written in a travel-guide fashion, with a brief overview at the front and then it takes the reader through the adventure, location by location. It does mean having to flick back and forth a lot to see how various parts link up. The art is sprinkled through the adventure. In the APs, they give a big chunk of the product to supplementary material, fiction, new monsters etc. WotC try to separate the encounter information from the plot exposition. The trouble is, there’s too much bleed over. There are 13 encounters in the Reliquary spread over 19 locations. All the locations are summarised over a mere two pages, with references to the combat pages in book two. The entire dungeon is presented over just 4 pages. There’s a lot of story/plot elements that only appear when you get to the encounter format itself, or worse, it’s duplicated. Those encounter maps are keyed with starting monster locations. Paizo blend all the mechanics into the prose sections of their keyed entries. They have a tendency to start with some boxed text that concentrates on the architecture and the furnishings. If there are any adversaries present, they get introduced right at the end of the entry. The description can be wide ranging about histories and relationships. Adversaries can be flagged up that don’t get explained until later in the book. Each entry rewards repeat reading and notetaking so that nothing gets missed, like the monsters. My blended approach would be to stay with the single book, but to separate it into sections to facilitate play at the table, and to make the inevitable page flicking easier. I would spread the art through the book. That gives it context and the company website or a scanner allows the images to be shown to players as required. I would put the stat blocks and tactics directly into the main body of the adventure. The delve format has only one pro (to not have to flick pages in the middle of a combat) and too many cons (repeated, or discreet, story info; the keyed map which can’t be printed; lots of white space; repeated environmental info and more). Fourth edition encounter design means that groups of opponents are far more likely to be encountered than solitary monsters or traps. The delve format brings all those stats to one place, but frankly, a 3e statblock for a single creature easily takes up half a full page. I don’t think it’s completely necessary to separate out the encounter info. At worst, the encounter info might run onto another page, but that’s a small price to pay for legibility and read-flow. Similarly, there’s no need to repeat the encounter map with starting positions. These positions should be apparent from the description, either the boxed text (enabling the DM to place the monster as they read) or within the description for hidden monsters and traps. These starting positions are wasted post the initiative roll anyway. Same with environmental effects like tables, chairs, doors, fires etc. All common environmental effects can be boxed out in an appendix or at the start of the adventure. The dungeon overview provided by WotC is actually fine, it’s concise and gives the DM what he needs, the story and enough to improvise on should the party enquire. This should be followed by the dungeon map. The Paizo maps are like architects drawings, they’re fascinating, inspiring even, but they are extraordinarily difficult to describe or map out at the table. They also have verisimilitude, with barracks, kitchens and kennels. There are more ’empty’ rooms than inhabited ones. Some of those empty rooms contain clues or history, but others are there just to fill out the map. There are lots of linked levels, and the DM has to be careful to see how inhabitants hear and see the other locations. It’s very pretty, but low on utility. On the other hand, the WotC map of the reliquary is made up of scanned dungeon tiles, and it’s squeezed into the A4 page. There are no dead ends, only 3 empty rooms, and it’s a largely straight sequence of chambers. There’s no sense that this was designed and built by anyone but a WotC employee. That’s not necessarily a bad thing, as it’s eminently playable. The DM and players won’t get lost and no-one needs to worry about what the surrounding locations are doing. It’s almost brutally functional. That would have been fine back in the days of 1st edition, but the modern audience is entitled to more. In fairness, the encounter book expands on this and gives read aloud text as well as tactics, but even then it errs on the side of sparsity. This is where the biggest change could be made. the locations should be able to be read as if part of a story, or at least a travel guide. Paizo go too far too often by including text that’s irrelevant to the adventure at hand, and tenuous in it’s relationship to anything the characters are likely to encounter. The happy medium would be for the text to be explanatory first and interesting second with inspiring a third priority. If it is only one of those three things, it’s missing the key element of a role playing game scenario. Lastly, and this isn’t in Death’s Reach, WotC have made strides to make the treasure placement more customisable in latter adventures. This is a great use of an appendix, and needs to help the beleaguered DM keep their game, and campaign, on track. In summary, I’d hugely expand the first book from WotC, using the best writing from the Paizo styles, and I’d contract the delve book into the body of the adventure. At every stage I’d look to see that the book remains a gameable product, and not something to be read in lieu of a novel. Brand loyalty. There’s something to say for it. Roleplayers are very bit as tribal as anyone else. For a couple of years now, the big division has been within D&D, between 4th edition, and Pathfinder. Or has it? some of the comments I got to my last post made it clear to me that actually the divide is just as much (or even more so) between the fans of Wizards of the Coast, and Paizo. Paizo’s fans characterise the company as open, friendly, communicative, passionate, helpful, charitable and many more things. Wizards detractors see them as big business, controlling, paranoid, out of touch and many more things. For me, I can’t quite see as many differences between the two as all that. I won’t deny that Paizo’s rep is deserved, but WotC? Why can’t they get any credit for what they do? Every product, decision or comment that comes out of WotC is treated so very uncharitably by fans, even by 4e fans. So, for those who see WotC as the bad guy in the RPG community, let me ask about these: the Encounters program, and the DM rewards program. For me, these are great initiatives that if any other RPG company did them would be showered with garlands. The best I’ve seen from outside 4e fandom has been grudging acknowledgement at best. Why can’t credit be given where credit is due? Why do Paizo always get such an easy ride? …and WotC do not, at least when it comes to their adventures. Readers of this blog will know that I’m a 4e fan, and that even extends to the published adventures. They’re far from perfect, in fact at times they’re downright awful, but overall they provide a good gaming experience. Hours of fun, as advertisers would say. I realise that’s a minority view. Spend a little time on forums or blogs to see some real vitriol towards WotC’s offerings. At best you might see grudging praise for the occasional one off adventure. The most lambasted products are the adventures in the H/P/E series of adventures, often called the Orcus modules. I don’t share those views. My gaming group has been happily playing those mods for the last couple of years, and we’ll continue to do so right to the end of the epic tier. We enjoy ourselves. Despite my largely positive opinions, I’m not blind to their faults. They are too often dry, mechanical, very linear, and almost entirely based on combat encounters. In an ideal world, I’d want more. So I’ve always kept my ear to the ground, looking for new adventures that might give me that more rounded adventure experience. Conventional wisdom says Paizo are the people to go to. Paizo fans are just as vocal as anyone, and to be fair their adventures are almost universally lauded as exemplars in the field of the modern module. They attract praise even from gamers who don’t play 3e, or even D&D at all for that matter. The stand out features are most often the ‘production qualities’ and the non-linear nature of the stories presented. I won’t disagree with those points particularly but I will say this: Paizo’s adventure paths are good scenarios, but that’s all they are, they’re not great. I believe this because I’ve just finished reading the entirety of the Legacy of Fire adventure path. I’ve also played the openers from Serpents Skull and Curse of the Crimson Throne. I tried to be objective, and apply my reviewer’s eye to them. I couldn’t help but compare and contrast with 4e as I went, consciously looking for conversion possibilities. So the Paizo APs are pretty average. That’s a provocative statement, mainly because the mods garner such near unanimous praise across the board. Compare with the reaction to WotC being accused of mediocrity, there’s rarely an organised or vociferous defence of their adventures. Let me try t back up my claims. I see a few consistent issues with the adventure paths I’ve read and played. They are choked with text. Vast reams of words, endless verbiage that, crucially, add little to the game. Some of this is because of the rules mentality, which provokes lots of explanation for materials and architecture and (the biggest offender) magic effects. Whole paragraphs are sacrificed to explaining lighting conditions. Whole pages go to statblocks, for creatures that are extremely unlikely to be entering combat. There seems to be a prevalent idea that everything has to be statted out, just in case the players want to break it. It means that for every flash of inspirational text, or illuminating exposition, there’s a seam of dry as dust text to be overcome. They’re written to be read rather then played. I really don’t think many groups have played all the way through these paths, although I think a lot of DMs have planned to do so. They strike me as ideal for subscriptions, because you get the sense of an unfolding story each month as it flops through the letterbox. I think the DMs really look forward to the next instalment, but I don’t see gaming groups being able to digest the adventures at that pace. I imagine most campaigns fizzle by the end of the second part. They’re too complicated. The plot synopsis takes two pages of double columned text, and they need to be read twice, while taking notes. Every location, or monster, or NPC is so defined, both by fluff and crunch, that it’s hard to hold them all in place in your imagination. There’s backstory piled on backstory, and exotic creatures with bizarre motivations. Again, it makes for a decent read, but players being players will only add complications to existing plots, so I prefer simplicity in the adventure. None of this is helped by the layout. The art is only ok. There’s some good pieces where the story in the text has been directly illustrated. Otherwise, it’s on a par with WotC, but no better. The layout is meant for reading rather than utility at the table. Again, I have huge issues with WotCs use of the delve format, but this is not much better. The stats run across multiple pages, and there’s a lack of a decent overview to guide you. They’re just as linear as any other adventure on the market, they just do a better job of hiding it. Yes, there’s lots of room devoted to what happens if the players go off piste, but it comes with heavy handed guidance on getting the plot moving forward in the direction the designer planned no matter what. Essentially, the adventures are padded out with lots of extra material, much of which will not see any use as the spine of the story proceeds directly from one instalment to the next. Diversions do not make for freedom. They’re slaved to the 3e rules, specifically to the presence and availability of high level magic. When wizards and clerics are not being catered for in the plots, they are being handicapped by Paizo fiat. Some spells just won’t work in certain circumstances, while some adventures come to a standstill without the use of spells. All the time the poor old fighters just sit on the sidelines. Almost every encounter is against a solitary opponent, or groups of exactly the same creature. 4e monster roles have spoiled me, and I can’t be doing with this type of opposition anymore. They’re slaved to Paizo’s world and cosmology. As I read through Legacy of Fire, I had to have my laptop open so I could look up the gods and nations of Golarion as I went. There’s really no nod to being a generic fantasy campaign, which is ok to an extent, but leaves little room for the DM to insert into their own world. Honestly, I don’t think I’ve read many adventures that don’t offer any guidance on customisation, except these. It’s tempted me to look deeper into Paizo’s world, but that would be research for no real gain (ie, nothing that would come out at the table). Half the books are not adventure at all. There’s a grab bag of fiction, new monsters, essays on locations or religions or whatever. It all makes each ‘issue’ more like a magazine than an adventure. Some of this stuff is absolutely fine, good even, but serves to embed the product further into the Paizo vision. Now, it’s important to say here, that I don’t have huge issues with any of these things. They’re fine for what they are, but that doesn’t make these perfect adventures, that every other publisher should look up to. What I really object to is the notion that WotC adventures are so much worse than this. At least the damn things are written to be played. There are some very, very good things to be taken from Paizo APs, things WotC could learn. However, this has already been a long post so I’ll save my thoughts on exactly what they could learn for another post.